Until the Civil War, the nation’s capital was a center of the slave trade. Lincoln biographer Paul Findley wrote that when Mr. Lincoln served in Congress, “The District was one of the busiest transfer points for slaves. They were often bought, sold, and delivered there, but still more often the District served as a depot for the transfer of slaves sold elsewhere. The public jails quartered slaves in transit, supplementing the privately owned ‘slave pens. '”1 One slave pen, Robey’s Pen, was just seven blocks from the capitol on 7th Street. 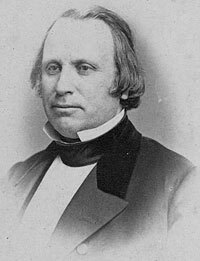 Lincoln biographer Isaac Arnold, who served in Congress for most of the Civil War, wrote: “Senator Wilson, of Massachusetts, the confidential friend of the President, on the 15th of December introduced a bill for the immediate emancipation of slaves in the District of Columbia, and the payment to their loyal masters of an average sum of three hundred dollars for each slave thus set free; providing for the appointment of commissioners to assess the sums to be paid each claimant, and appropriating one million of dollars for the purpose. The debates upon this bill involved the whole subject of slavery, the rebellion, the past, present, and future of the country. 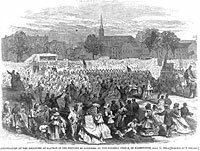 The bill passed the Senate by yeas twenty nine, nays six.”3 The Senate voted on April 3 to abolish slavery in District of Columbia and two days later, President Lincoln indicated he would sign the legislation. The bill’s opponents in the House, however, seemed intent on delay and destroy tactics. Fellow citizens of the Senate, and House of Representatives. The Act entitled “An Act for the release of certain persons held to service, or labor in the District of Columbia” has this day been approved, and signed. I have never doubted the constitutional authority of congress to abolish slavery in this District; and I have ever desired to see the national capital freed from the institution in some satisfactory way. Hence there has never been, in my mind, any question upon the subject, except the one of expediency, arising in view of all the circumstances. If there be matters within and about this act, which might have taken a course or shape, more satisfactory to my jud[g]ment, I do not attempt to specify them. I am gratified that the two principles of compensation and colonization, are both recognized, and practically applied in the act. Paul Findley, A. Lincoln, The Crucible of Congress: The Years Which Forged His Greatness, p. 127-128. Herbert Mitgang, editor, Washington, D.C., in Lincoln’s Time: A Memoir of the Civil War Era by the Newspaperman Who Knew Lincoln Best: Noah Brooks, p. 180-181. Isaac N. Arnold, Abraham Lincoln, p. 243. Margaret Leech, Reveille in Washington, p. 241-242. Moorfield Storey, Charles Sumner, p. 206. Herbert Mitgang, editor, Washington, D.C., in Lincoln’s Time: A Memoir of the Civil War Era by the Newspaperman Who Knew Lincoln Best: Noah Brooks, p. 181-182. 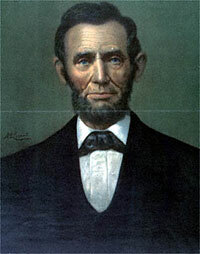 Isaac N. Arnold, Abraham Lincoln, p. 244. Moorfield Storey, Charles Sumner, p. 207. Roy P. Basler, editor, The Collected Works of Abraham Lincoln, Volume V, p. 192 (April 16, 1862). Don E. and Virginia E. Fehrenbacher, editor, Recollected Words of Abraham Lincoln, p. 7 (printed in New York Times, January 14, 1861). Theodore Calvin Pease, editor, Orville Hickman Browning, Diary of Orville Hickman Browning, Volume I, 1850-1864, p. 541 (April 14, 1862). Margaret Leech, Reveille in Washington, p. 242. William K. Klingaman, Abraham Lincoln and the Road to Emancipation, 1861-1865, . Herbert Mitgang, editor, Washington, D.C., in Lincoln’s Time: A Memoir of the Civil War Era by the Newspaperman Who Knew Lincoln Best: Noah Brooks, p. 182-183. Mr. Lincoln and Freedom © 2002-2019 The Lehrman Institute. All Rights Reserved.